2″ ridge pipe on TOP pf ribs – fixed the problem. Since adding the ridge the greenhouse has withstood several substantial snows with no problem whatsoever. When I know that snow is coming I add a couple of 2×4 props under the ridge for insurance. Problem solved. 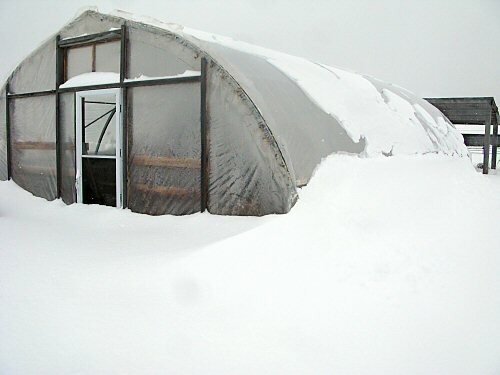 BTW, there are many hoop houses in my area and in areas that get lots more snow that work fine and don’t collapse when it snows or when the wind blows – including a HUGE commercial operation about 10 miles away that grows hydroponic lettuce year round. My design just needed a little refinement. If you never fail it’s probably because you never do anything.